We left our fabulous new friends at Camp Rubrenovik and set off for the Tara River Canyon. 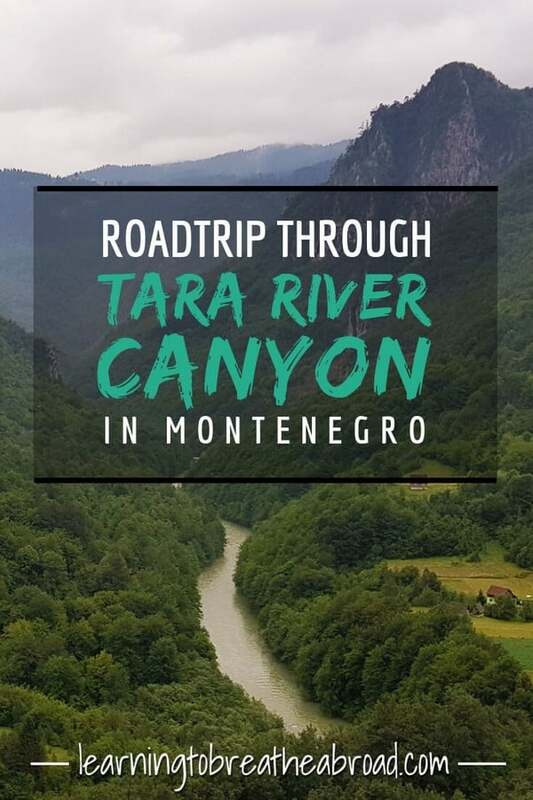 Also known as the Tara River Gorge, this is the second longest canyon in the world, after the Grand Canyon and at 78 kilometres in length and 1,300 meters at its deepest, it was most certainly impressive. 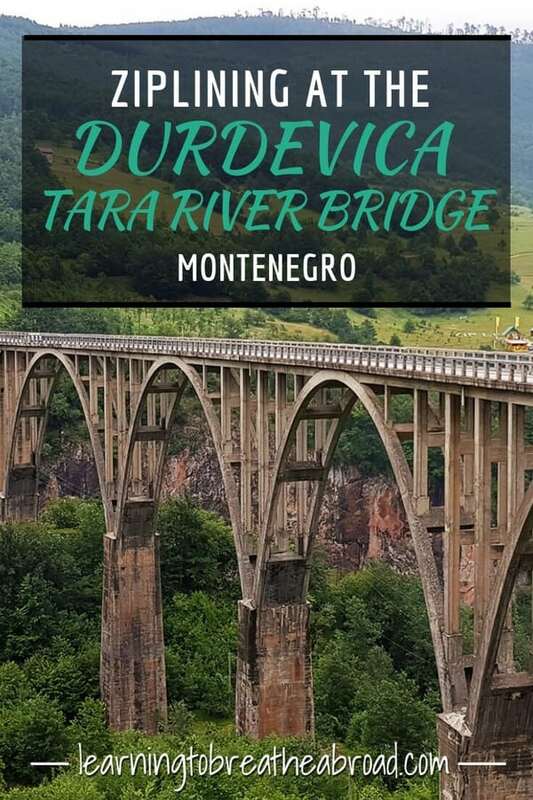 The section of the Gorge passing through Montenegro is protected as a part of Durmitor National Park and has been given UNESCO World Heritage Site status. The road followed the contours of the Tara River as it cut through the Gorge and took us through numerous tunnels hewn out of the rock. None of the tunnels had lights, but the white line shone brightly and they were short tunnels, so not too scary to drive through. There were hardly other cars on the road, so we tootled along at our usual snail’s pace, pulling over whenever we found a spot to stop and enjoy the view. The mountains seemed to reach straight up to the heavens on either side of us, with dense forests and the tallest trees I’ve ever seen. The forests were interspersed with dramatic sheer rock faces with white, orange and black marble colouring. It was breathtaking and almost impossible to capture as a photo. The sideroad down to the Dobrilovina Monastery looked a little narrow for Miles, so we parked up and walked the 500m down the country lane. The spring flowers were out in abundance, along with colourful butterflies, bees and huge bumble bees. In fact, there were at least 20 beehive boxes in the area, so both being highly allergic, we watched our step and moved slowly and carefully. The little stone monastery sat amongst lush fields in a truly tranquil setting. A local man approached us, showing us his bag of full of wild mushrooms that he was taking home to eat. He asked us to follow him and at the top of a little path, pointed up into a tree where a big natural beehive hung. He then proceeded to pick raspberries off a wild bush. Nothing like gathering your supplies directly from nature. Tai’s not always in the mood for sightseeing! 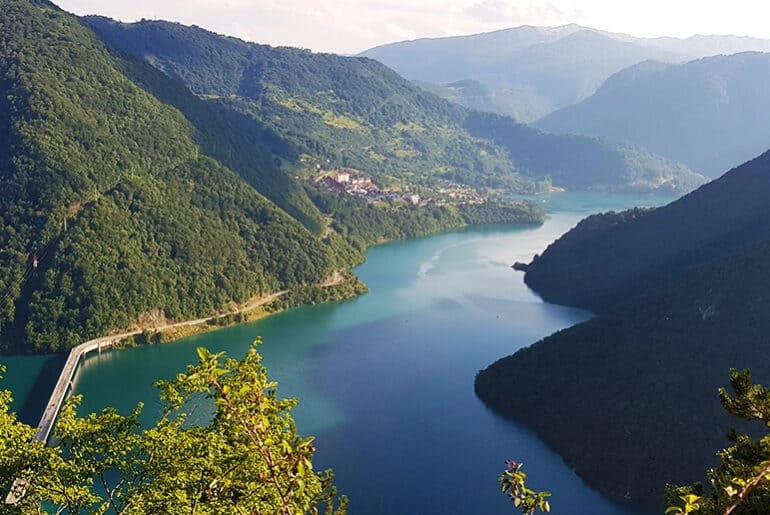 Lake Zabojsko was on my to-do list, but as we approached, Google maps showed a serious serpentine road leading the 9km and 800m elevation up to it. We’ve done some crazy roads so that didn’t bother me until we saw the road. A rutted dirt road lead off into the forest… hmmm… I don’t think so, so we decided to give it a miss. 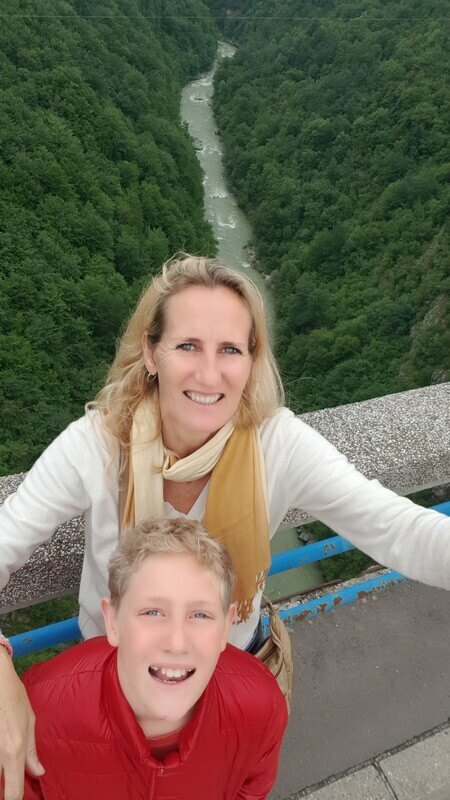 Suddenly through the trees, we caught our first glimpse of the famous Durdevica Tara River Bridge. Tai’s reaction… “Oh, my word that is beautiful!”… and it most certainly was! Standing 172m above the river, this graceful lady stands as a testament to man’s architectural genius. The owner of the Most Restaurant agreed to let us park overnight for free if we ate at the restaurant, so we parked up and ran down to the bridge to have a closer look. The main thing on our agenda was the ziplining. We had been told there were different companies operating, some cheaper than others and I had noted this in our plans, but the excitement of the moment overcame me, I completely forgot the advice and headed straight for the first ziplining company (yellow). Yip – it was the most expensive – at 20€ it was actually double the price of the Green Zipline! 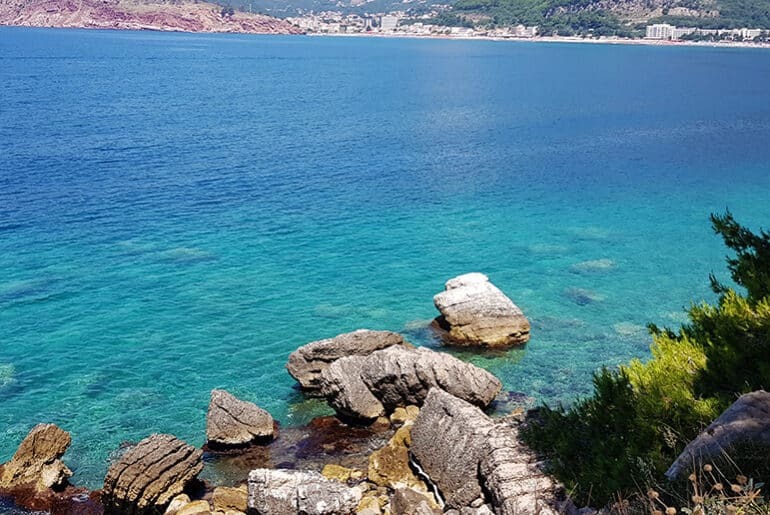 Note to self – always check travel notes when arriving in a new destination! The zip line was AMAZING though! We loved every second of it! 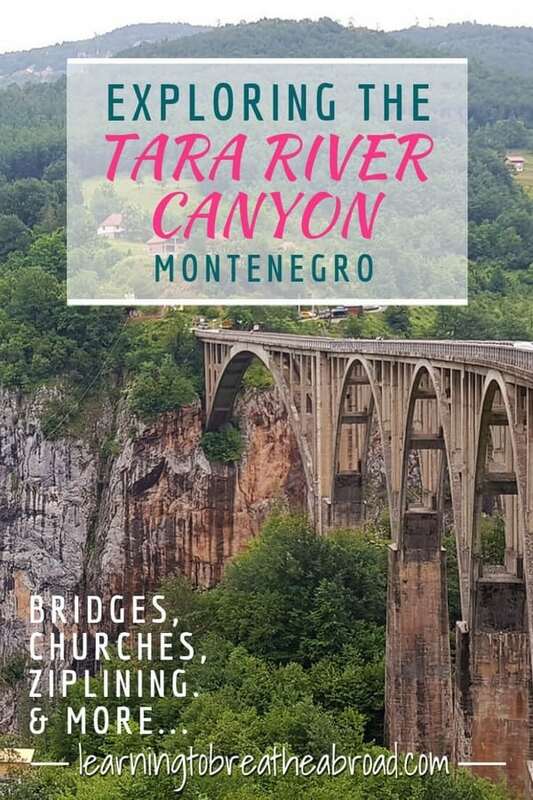 After the initial rush of flying through the air at 80-100km/h, you start actually taking in the surroundings, the incredible Tara River Bridge beside us and the Tara River rushing nearly 2km below! What a rush and a definite must to anyone passing this way. The next morning was raining, so we hung at the restaurant doing some work. 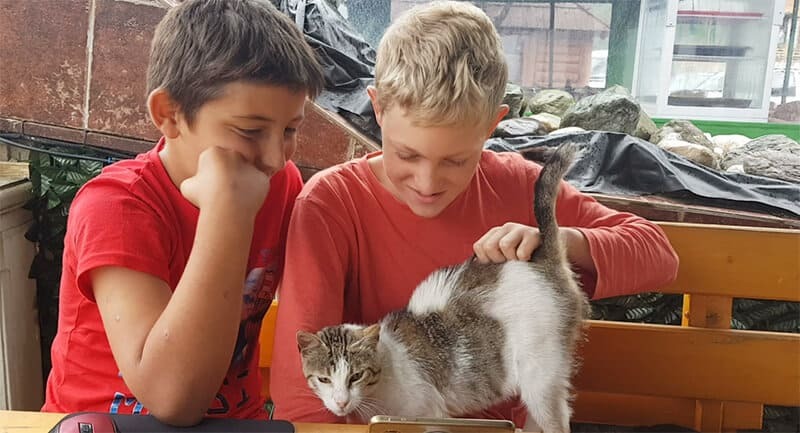 Tai befriended a local boy named Marco and the two of them spent the morning chatting via Google translate. The two of them went off to play when suddenly I hear Tai shouting. I looked up just in time to see a little orange blob (he was wearing an orange t-shirt and shorts) coming screaming across the gorge on a zip line! It later transpired that Marco’s mum worked at the restaurant so Marco got to go on the zip lines for free, and he treated Tai! Lucky boy! This cat wouldn’t leave Tai alone. 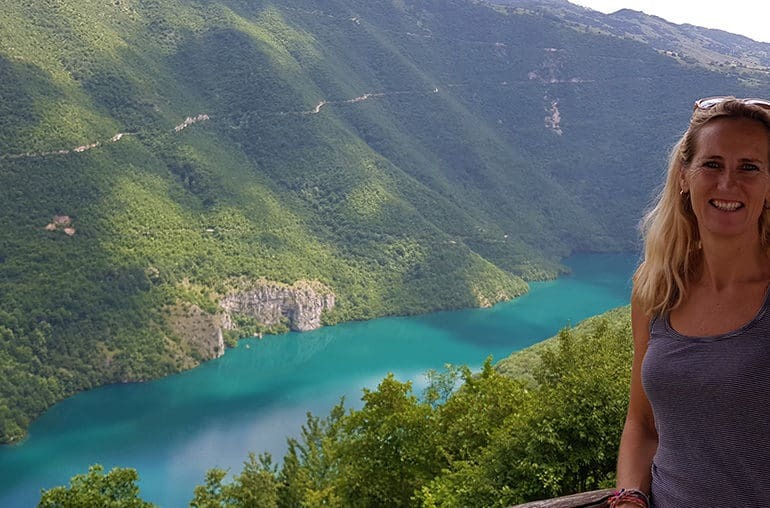 There are incredible trails and hikes to be done in Durmitor National Park, but we were unlucky with icy cold and rainy weather, so sadly never got to experience these.